LAKE CHARLES, La. -- Western Louisiana residents braced for more wind and water early Wednesday as Tropical Storm Harvey made its second landfall after dumping record rainfall on Texas. The storm came ashore just west of Cameron, Louisiana, bringing maximum sustained winds near 45 mph (72 kph), the U.S. National Hurricane Center said. Harvey had lingered over Texas for days before meandering back into the Gulf of Mexico. Forecasters said there was a risk of tornadoes across a large part of the South as Harvey trudged northeast toward northern Louisiana. The national Storm Prediction Center said a few tornadoes were expected to develop Wednesday in northeast Louisiana and across southern and central portions of Mississippi. Tornadoes would also be possible across parts of southern and central Alabama, near the eastern edge of Harvey's rain bands. Another 5 to 10 inches (13 to 25 centimeters) of rain could fall in western Louisiana, forecasters said. "We are starting to get down to the end of the tunnel of all this rain," Meteorologist Roger Erickson said. Erickson warns that some coastal rivers won't be able to drain effectively because Harvey's winds are pushing in storm surge, aggravating flooding in areas already drenched by more than 20 inches (51 centimeters) of rain. Gusts up to 50 mph (80 kph) are predicted for coastal areas and up to 40 mph (65 kph) in Lake Charles and along the Interstate 10 corridor. Cameron Parish's Office of Emergency Preparedness said a curfew was in effect until the threat had passed and checkpoints have been set up at entry points into evacuated areas. State offices in 28 parishes and most Baton Rouge area schools won't open Wednesday in anticipation of possible severe weather. Gov. John Bel Edwards urged people to remain alert but said the state is responding well to less severe conditions in its own borders. "You never know what Mother Nature is going to throw at us, but with the people in this room, I'm confident we can handle it," he told local and state officials during a visit Tuesday to Lake Charles, which is near the Texas border. Edwards said Louisiana also has offered to shelter storm victims from Texas. He said he expects Texas officials to decide within 48 hours whether to accept the offer. Harvey's devastating flooding brought back tough memories in New Orleans as Tuesday marked the 12th anniversary of Hurricane Katrina. Mayor Mitch Landrieu opened his Tuesday news conference with a moment of silence for Katrina victims and words of support for Harvey's victims in Texas and southwest Louisiana. "We've got to save our house," New Orleans resident Israel Freeman said as he loaded sandbags for his mother's home into his Cadillac. "She already went through Katrina. She built her house back up. We just had a flood about two, three weeks ago. She just recovered from that." Bradley Morris lives in a ground-level house in New Orleans and was "preparing for the worst." "There's plenty of puddling and stuff already," he said, "so I just assume that we're probably going to get a taste of what we had a couple weeks ago." Landrieu urged residents to stay home Tuesday because of the threat of potential high water. Some New Orleans neighborhoods flooded earlier this month during a deluge that exposed problems with the city's pump and drainage system. 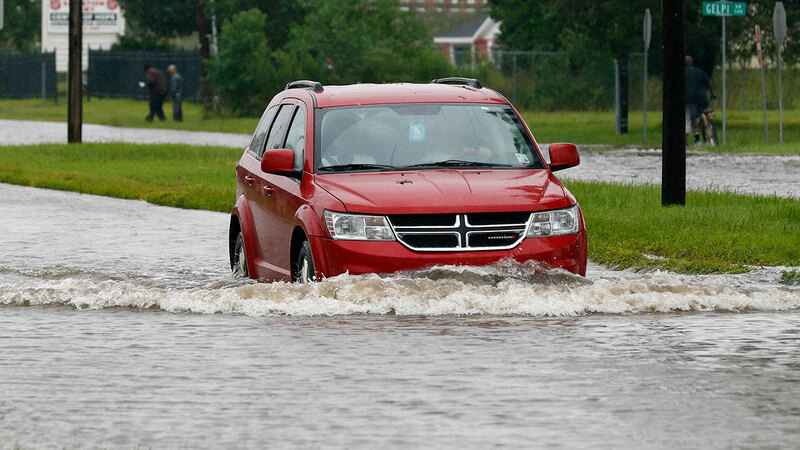 On Tuesday, rains flooded a few of the city's streets, but not to the same extent. New Orleans officials planned to reopen government buildings and public schools Wednesday, a day after they were shut down amid fears of flooding rain from Harvey. "The weather outlook got a little bit better for us," Mayor Mitch Landrieu said. He cautioned however, that a change in the forecast could mean a change in plans. About 500 people were evacuated in southwest Louisiana's most populous parish early Tuesday, as a heavy band of rain pushed waterways out of their banks, Calcasieu Parish spokesman Tom Hoefer said. He said as many as 5,000 parish residents were affected by the flooding, but not all of those people have flooded homes. Some are just cut off by flooded roads. Evacuations continued Tuesday in some rural areas outside Lake Charles, with authorities working to empty a flood-prone subdivision near the town of Iowa. Officials in Acadia Parish advised residents near the Mermentau River and Bayou Nezpique to leave. Family members and authorities in Texas have reported at least 18 deaths from the storm. No Harvey-related deaths were immediately reported in Louisiana, according to a spokesman for Edwards.